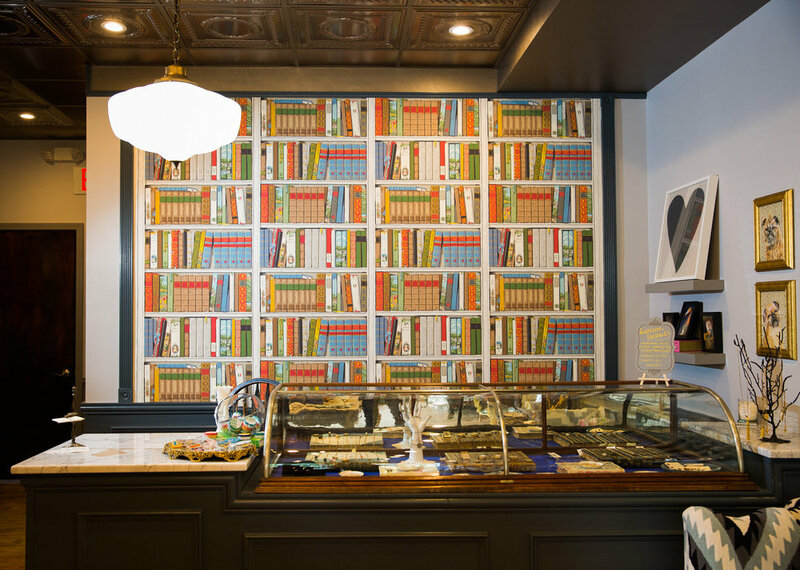 Thistle & Bess brings a smart, vintage flare to the Ann Arbor area, offering one of a kind antique treasures, along with well-curated goods, to the stylish hostess seeking a luxurious lifestyle. As avid collectors ourselves, we travel the world looking for high quality vintage and antique treasures that are a bit quirky and seriously stylish. We also aim to carry the most innovative new brands, handcrafted in cities all over the world, from Brooklyn to London. Thistle & Bess provides unique products, whether it is vintage barware or a statement necklace, to a consumer seeking something a bit eccentric, collected and different. We also specialize in fine jewelry, carrying some unusual pieces that are handmade by artists from all over the world. Thistle & Bess strives to be an active member of the community, offering a gathering space for small exhibitions, workshops and events that feature local artists and products. Thistle & Bess began as an antique and vintage jewelry line in Brooklyn, NY, owned and designed by Ann Arbor-area native Diana Marsh. Diana loves collecting antiquarian books, prints, and vintage and antique charms and pendants. This passion for history drives her to seek beautiful and unusual trinkets that tell a story. The shop name, Thistle & Bess was inspired by Diana’s Scottish and English heritage. The tough but beautiful thistle is the emblem of Scotland and Bess is for Queen Elizabeth I, nicknamed “Good Queen Bess.” As the jewelry line Thistle & Bess began to grow, Diana realized the need to bring more interesting and well-made products to consumers. In a market dominated by chain stores, Diana envisioned creating a storefront that offered the customer fresh and exciting new products, unique in artistry and quality. Diana thought that the quaint and creative Kerrytown area of Ann Arbor was the perfect community for her to realize her vision. Thistle & Bess carries a variety of products, including fine jewelry, fashion accessories, barware, bath and beauty products, home accessories, paper and select children’s clothing and toys. Come visit the shop! Thistle & Bess is located at 222 N 4th Ave in the charming Kerrytown area of Ann Arbor. There is metered parking nearby at both the Kerrytown Market and Shops and in the Farmer's Market Lot. The closest parking structure is located at the corner of 4th Ave. and & Washington. We have some great things planned at the shop! See below for dates and brief descriptions of upcoming events. Spring/ Summer Events at Thistle & Bess!